Mention has already been made concerning the absolute necessity of having a definite objective at the outset. Vague ideas on the subject are hazardous. Assuming then, that a plant layout has been determined and the floor space calculated for the presses to be used, the production problem must now be approached. If orders have not been actually taken or promised, requirements have at least been anticipated and estimates must have been made on the items to be sold. Knowledge as to whether the customer’s needs are five thou sand or a million units over a given period naturally affects the price he is quoted. This is true in the submission of any quotation due to the economy that can be realized in continuous production. The settingup and dismantling of a plastic injection mold for small quantity requirements is expensive and a long run is usually the most desirable. 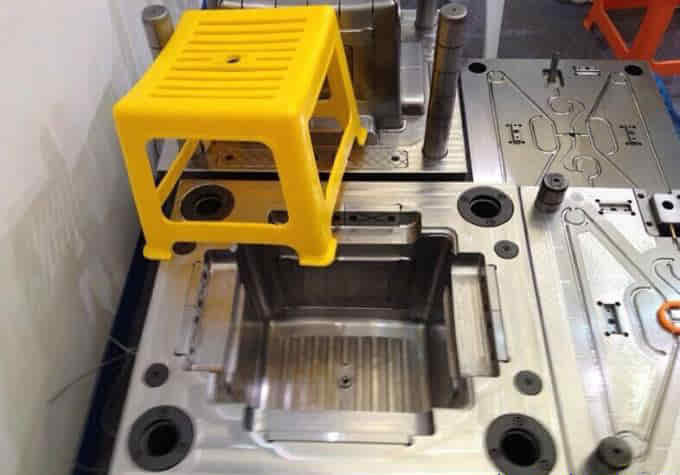 Aside from these features, there is another factor which influences the newcomer in the plastic injection molds making field, for with sufficient large quantity orders he is then in a better position to purchase his powder at a lower price. Buying molding plastic material, whether it be the phenol or urea type, is an expensive proposition when purchased in single drum lots. Even now, some of the smaller users are paying as high as twenty five percent more for molding powders than the larger plants. If this differential can be obliterated, one great disadvantage will have been overcome. But it will be impossible to enjoy the minimum price unless a sufficient amount of business is first obtained to warrant a large powder order. So, rather than having one or two large accounts on the books, a much better condition is to gain the business of a half dozen or more. Before it is possible, however, to accept large orders it is essential that reasonable production is promised. Large quantity orders usually entail rapid deliveries and a definite schedule must be submitted to the customer. 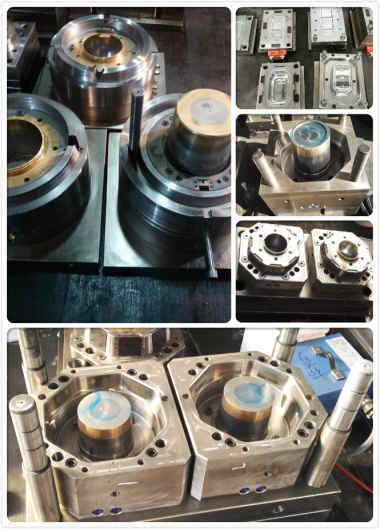 In order to live up to these promises, either a large multiple cavity die must be made or two smaller molds for producing the same article. In the past, general practice has leaned towards the larger mold, but for many reasons two dies are more practical. Such practice insures the molder, to a certain degree, against complete loss of production in the event that repairs have to be made on the die, or if the larger injection molding machines are unavailable. In other words, if something happens to one of two molds, repairs can be made while the other mold continues to run. Production is crippled, to be sure, but not completely stopped as would be the case with one large mold. The metal-removing process of planing takes place when the cutting tool moves by a straight back-and-forth motion with respect to the work, or when the workpiece moves in a straight back-and-forth motion with respect to the tool, which is stationary. Four types of machine tools operate according to one or the other or both of the above principles: the planer, the shaper, the slotter or vertical shaper, and the broaching machine. In shaping, the tool is reciprocated and the feed of the steel for cap mould manufacturing is represented by the width of the cut. Shaping is particularly suited for small work in view of the design and construction of most shaping machines. (It is seldom used to machine work more than two feet square.) Shaping entails producing flat surfaces in horizontal, vertical, and angular planes. In addition, internal surfaces and odd-shaped surfaces can be shaped. The work is usually clamped in a vise fastened to the table. The typical toolroom shaper has a universal table that can be tilted to 15° and swiveled through an arc of 180°. Because of its flexibility, the shaper is considered a basic machine tool. It is widely used as a toolroom and die shop facility and, in view of the rate of metal removal, is of limited use in large production runs. The vertical shaper, commonly known as a slotter, is similar to the shaper except that the ram is reciprocated in a vertical slide. The stroke range in vertical shapers is from 6 to 36 inches. For shaping clearance, the ram may be adjusted to move at an angle to the vertical. Circular tables for holding the work are usually standard equipment with the vertical shaper. Round shapes can be generated by rotating the table by power feed； however, this is usually not the most economical technique for producing circular shapes.The vertical shaper is used primarily for slotting or key-seating operations. 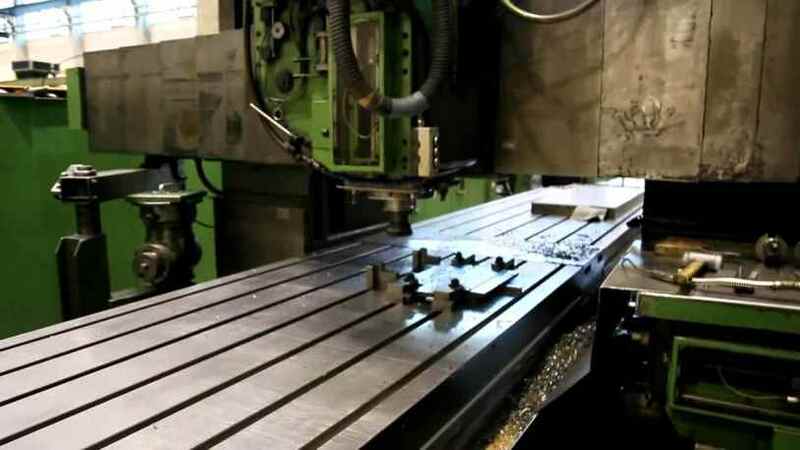 The planer is used primarily in the machining of flat surfaces, where the magnitude of the work is such that it is impractical to machine on a shaper or milling machine. 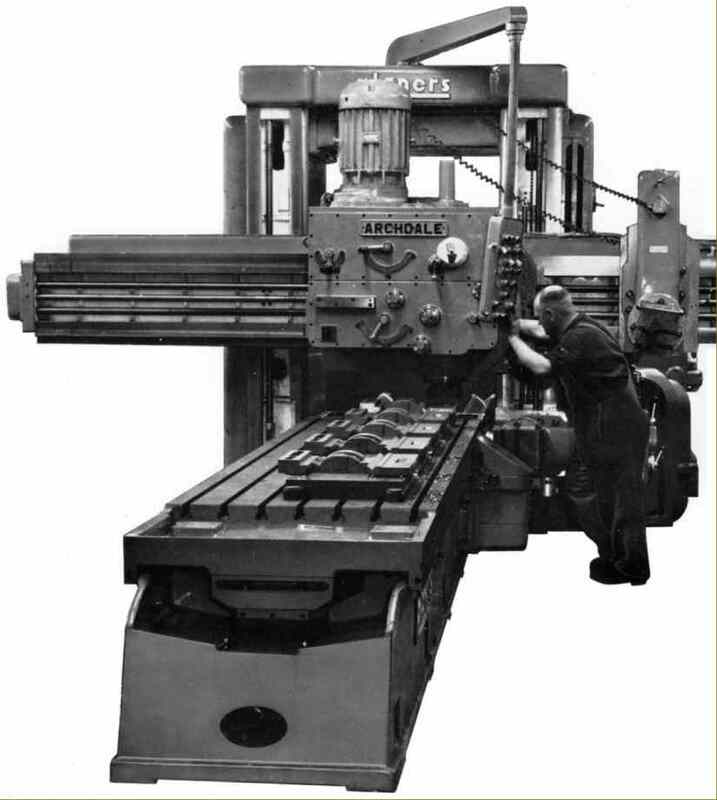 The planer has a long horizontal bed upon which the work-holding table slides with a reciprocating motion. Above the work table, the tool head (or heads) is mounted on a horizontal crossrail. The tool head is mounted on a slide to permit vertical adjustment so as to set the cutting tool to the correct depth. The crossrail may be adjusted vertically in order to accommodate various sizes of work. It is faster and more simple to operate. It is a less expensive piece of equipment and uses less power. Heavy cuts are required on large flat surfaces. The material to be cut is relatively hard (large steel castings). Accurate finish is required in such work as slides and guides. Shaper and planer tools are similar except for size, the planer tools being considerably larger in order to accommodate the larger work. Because of the intermittent cutting action of both the planer and shaper tool, toughness is an important criteria in tool-material selection. Consequently, high-speed steel is most commonly used； However, carbide-tipped tools are used for taking light or finishing cuts. It is important that the depth of cut, even when using carbides, be greater than 0.010 inch so as to get a cutting rather than a rubbing action. The front clearance angle should be about 4° so as to prevent rubbing of the back of the tool on the work. A side clearance of 3° is usually considered adequate. In the cutting of mild steel, a 12 to 15° side rake is advocated. For cast iron where less shearing action is needed, 3° side rake is recommended. The back rake varies from 0° for roughing cuts to about 2° for finishing cuts. With these small rake and clearance angles, the tool is more able to withstand the force of impact at the beginning of each cutting stroke. Reamers are tools used for enlarging and finishing diameters of holes to accurate dimensions . A rose reamer cuts on the end and has a chamfer of about 45° on the edge to aid in entering the hole. The fluted chucking reamer, which does more accurate work, is tapered slightly on the end to aid in entering the hole and it cuts on this tapered surface. In general, the reamer follows the hole being reamed. It will change the direction of a hole only slightly. A reamer performs best as a sizing tool when driven by a floating holder that permits it to follow the hole as the reamer is driven through. There are many types of reamers, with straight or spiral flutes, expanding and adjustable blades. They are made to cut different materials, and designed to cut both taper and straight holes. provision should be made for the reamer to pass through the hole. Blind holes are difficult to ream, and should be undercut at the bottom on the reamed surface. A drilled hole must be made accurate as to size. It requires a drill bushing which is removable (known as a slip bushing), and sometimes a reaming bushing added. The reamer must be available to provide the size in the particular material； and must be able to fit the machine tool. Gages (usually plug type) must be available to check the hole, for both operator and inspector. Duplicate sets of reamers should be available, because production must not be delayed when reamers wear and require sharpening. Wear on the flutes reduces the diameter of the reamer. When the diameter is below the tolerance required, the reamer may be either scrapped or salvaged by grinding for use on smaller diameter holes. The designer should standardize reamed hole sizes. Hole sizes are based on mating part dimensions. It is economical to make pins and shafts from cold-rolled and ground stock in order to reduce the amount of turning and grinding to size. Since this material comes in sizes which are to size or under, a series of reamers should be standardized which will ream holes ±0.002 inch or, according to the designers preference for clearance between shaft or pin and hole. Whenever a surface must be turned or ground on a pin or shaft, the size should be specified so as to offer the proper fit for a standard-sized reamer, ±0.0005 inch. The oversize reamers cost more than standard-sized reamers, but when they wear they can be ground to a standard size, and thus have a double life. All of the other metal-removing processes are closely related to or are modifications of these five basic processes. 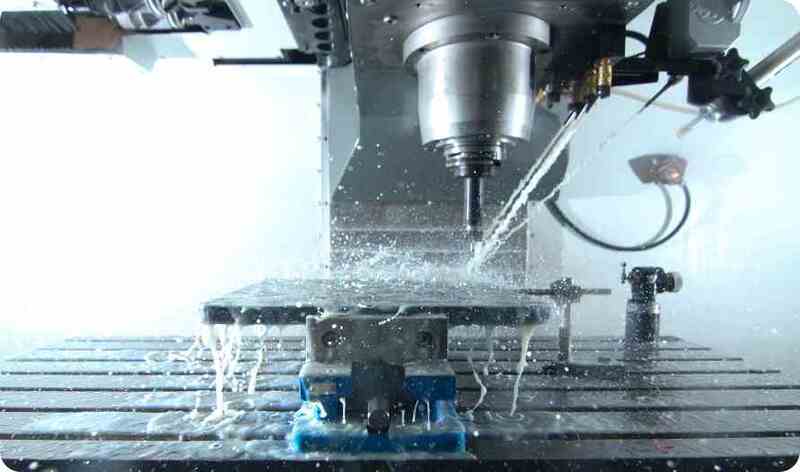 For example, the process of boring is internal turning； reaming, tapping, and counterboring modify drilled holes and, therefore, are related to drilling； hobbing is a milling operation； honing, lapping, superfinishing, polishing, and buffing are refined grinding operations； sawing can be either milling (if it takes a circular saw) or planing (if it is done by hacksawing or bandsawing)； broaching is a form of planing. The amount of material removal of the various cutting processes may be quite small，as in polishing and buffing operations, or it may be relatively large, as in milling and turning processes. It is the purpose of this chapter to present the various material removal processes that are available to the production design engineer so that he will be able to specify the most favorable manufacturing procedure. Drilling is probably the widest used machining operation. There are only a few processes, such as punching, boring, and burning, which can be substituted economically for drilling operations. All of these, however, have decided limitations； and in many cases, although another process can be used, it is still more economical to drill. Good drilling practice will result in little variation in location of holes, and size and shape can be depended upon at a minor tool cost. The principles of cutting metal apply to drills as well as to single-point tools. The surface of the drill flutes must be smooth so that friction will not retard the movement of the chips up and out of the drilled hole. The cutting angles must be ground to suit different materials, and adequate lubrication must be provided. The most important factor to be controlled to assure satisfactory drill performance is the accurate grinding of the drill. If one lip is ground at a different angle from the other, the tool will feed off-center and will drill an oversized hole. Also if the angles are the same, but one side is longer than the other, a thicker chip will be cut on one side, causing the drill to cut oversize. In addition, improper grinding results in an unequal distribution of forces acting on the drill, which may cause drill breakage. Drills should be ground in a drill grinder rather than by hand so that an unskilled operator can provide drills that are ground properly and save the time of the skilled operator. Drills for different kinds of material, such as plastics, nonferrous metals, cast iron, steel, and alloy steels should be stocked in the tool crib, available for use with the particular material. The use of proper feeds, speeds, jigs, and equipment with true-running spindles will increase the life of tools, result in the drilling of more holes per hour, and give greater accuracy. Drilling is a major operation, and a small percentage saved can amount to a considerable amount of money. Improvement in drill performance has recently been made by the introduction of better tool material, polished flutes chromium-plated to reduce wear, and improvement of the shape of the cutting edge. There are 20 different types of twist drills, as well as flat drills, straight-flute drills, core drills with three or four flutes, multicut drills, step drills, multiland drills, and combination drills and reamers. In order that the possibilities of the various types of available drills might be understood, the suppliers of drills have developed data which suggest the best shape of drills for each of the large variety of materials. One design may require the use of several types of drilling equipment, jigs, and fixtures. A good design reduces the number of different machines and the sizes of drills, reamers, and taps used. Good designs endeavor to place the holes on a single plane and maintain constant depth of all holes drilled. Effective design and production will be made possible by a knowledge of drilling equipment, cutting tools, and auxiliary equipment. When drilling is done, the work is brought to the fixed spindle of sensitive and upright drilling machines (both single spindle and gang drills) or the spindle of a radial machine is brought into position as the part is held stationary. Parts are held in vises or jigs and moved under the drill spindle along the table. Often two, three, four, six, or eight spindles are mounted over one table so that the part can be drilled, reamed, tapped, or counterbored without removing the part from the jig. Quick-change chucks also enable additional drill sizes to be used on the same machine and spindles. When radial drills are used, the part is stationary and usually in a jig. Often the jig is suspended in a trunion and can be drilled from any side parallel to the axis of the trunion. Quick-change collets enable the operator to change from one drill size to another, or from drill size to reamer, boring bar, or tap. Radial drills are designed so that feeds and speeds can be changed quickly to accommodate, use of the large variety of cutting tools. Multiplc-spindle machines and single-spindle machines equipped with multiple-spindle drill heads may be fed simultaneously into the work. The length and time of feed are determined by the longest hole to be drilled and the drill having the lowest feed requirement. Rpm can be varied in some cases with special gearing，but rpm，s, in general, are the same for all drills mounted in the head. The drills are guided by bushings mounted on the drill press head or in the jig. 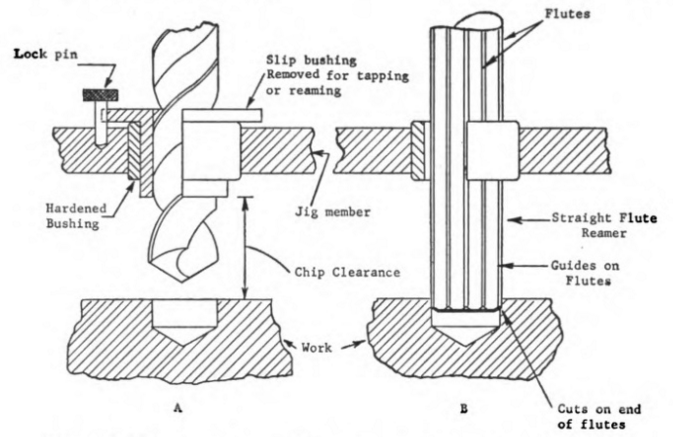 Drilling, reaming，and tapping can be performed in multiple-spindle heads. Usually each operation is done in a separate machine. Wherever a number of holes can be drilled at the same time in a part of moderate activity, the multiple-spindle drill is economical. 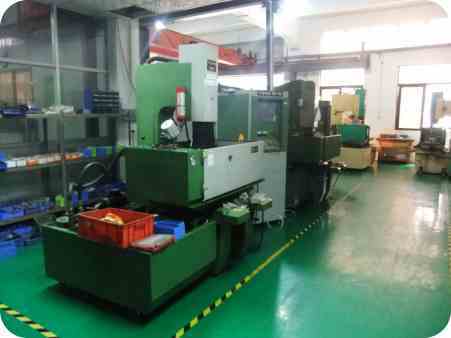 Multiple drilling is applied widely in mass production and can be economically adapted to job shop work. 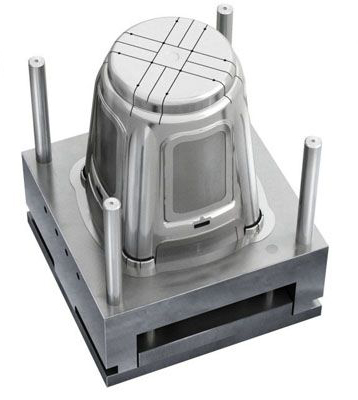 Bolt holes for cover plates, bearings, glands, and housings, can be standardized to use similar jigs and setups and promote the use of multiple-spindle drill presses. The part, jig, and tool must be designed to withstand the pressure of the tool as it is cutting. The new cutting tool materials have raised speeds, feeds, and pressures until only the most modern equipment can take full advantage of the new features. The engineer should use the data furnished by equipment and tool suppliers as a guide, and experiment with feeds and speeds in order to remove the greatest amount of material consistent with an economical tool life. The cost of the operation and machine must be balanced against the cost of tool wear, and against sharpening and setup time. 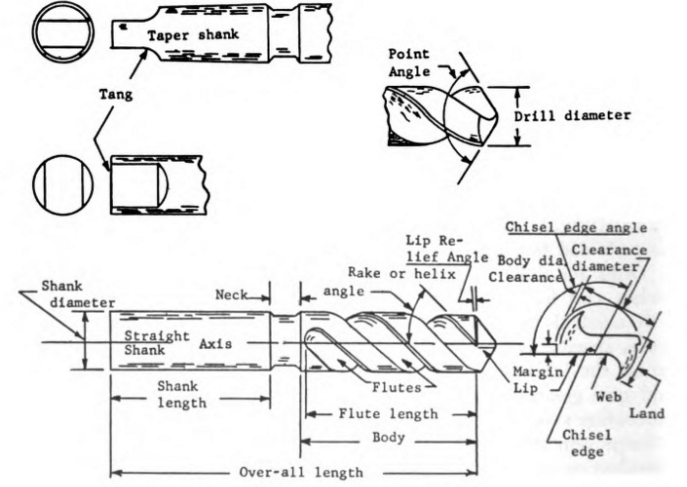 A drill, on entering material, has a tendency to wobble until the entire drill is cutting. Thus the accuracy of the location of a drilled hole is increased by using a punch mark, a smaller diameter drill (which wobbles less), a stub or short drill rigidly held in position by a good spindle, and a guide bushing. If accurately located holes are required, it is necessary to make the part on a precision machine like a jig borer or a horizontal boring machine, or to use guide bushings mounted in a jig . Numerically controlled turret-type drill presses with the table automatically positioned can drill, ream, tap, chamfer, and counterbore any quantity of parts without a drill jig. The table holding the work is accurately positioned, the turrets are rotated, proper speeds selected, proper advance and cutting feeds selected by a master tape or punched card. The operator merely places the tape in the control, installs the cutting tools in the turret, and locks the part on the table with vee jaws or clamps. Avoid deep holes. Any hole longer than five times its diameter is considered a deep hole and requires special procedures in the shop, such as withdrawing the tool at intervals to clear the chips, and forced lubrication. Start and finish holes on surfaces at right angles to the direction of the hole. Provide room for a bushing and its support in the jig or a fixture to guide the drill. Use standard-size drills for tapped holes and clearance holes for bolts, screws, rivets, and bushings, so that minimum stock of drills can be maintained. Use drilled holes instead of reamed holes wherever possible, provided the shop can produce good quality holes through proper grinding and tooling. Use the same size hole, or tap wherever possible, so that the minimum number of spindles and drills will be required. The tool finishing section completes all tools produced, whether cast, laminated or both. Their work consists mainly of trimming, fitting, assembling and checking the entire tool for conformance to design specifications. Equipment required consists mainly of tool crib items, such as disk sanders, rotary files, and hand routers. All minor repairs and alterations to casts and laminates are made by this group. 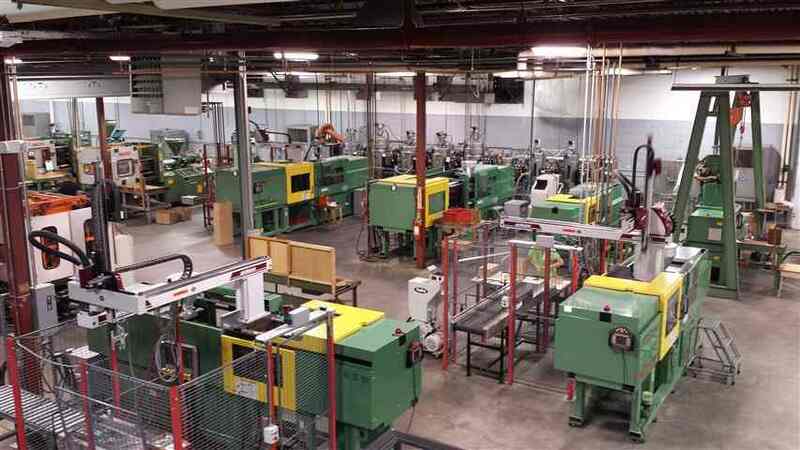 injection molders must be experienced, skilled tool engineers who know the entire plastics injection mold making operation and what is required of a tool in order that it function properly. They must be provided with work benches and adequate storage facilities for personal tools and equipment. This section is used to test or “proof” the tool in either actual production equipment or simulated equipment. Such equipment as draw presses, stretch presses, hydropresses, etc. are often involved. Personnel should consist of tool and die makers with broad enough experience to enable them to alter a given tool so that it will function properly, and co-ordinate with other tooling involved. Service Facilities. In practically all plastics tool shops a central tool and supply crib is most economical. Such cribs must be stocked with adequate precision cubes, knees, straight edges, height gages, vernier scales and the accessory equipment normally needed in conjunction with these tools. A stock of hand tools, cutting tools, etc., required to do the actual work must be maintained. The same section will also store and dispense shop supplies. It is also a logical point to maintain inventory records of plastics materials, rein forcing material and all other major supply items required by the plastic moulding companies. Sanitary facilities must be provided. The most effective way to control industrial dermatitis is by practice of adequate personal hygiene. 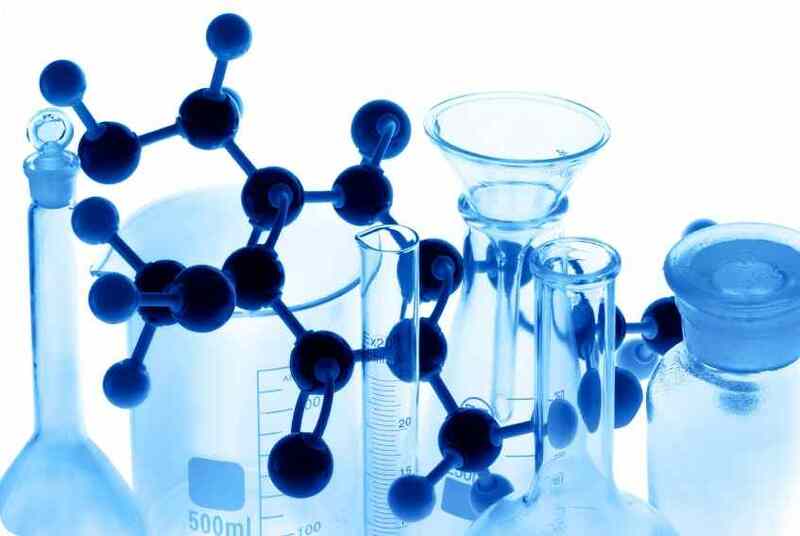 All personnel who come in contact with chemicals such as plaster, plastics resins, glass cloth, parting agents, etc., should be provided with individual steel lockers and adequate bathing facilities, including showers.